Hayes Valley Art Works, a “community creation space,” was erected on historic Parcel O on the corner of Fell and Laguna streets, in Hayes Valley. Artists, students, neighbors and families come to “the Works” to create and appreciate visual and performance art, as well as study permaculture, ecology, and urban design with creator and Director Jay Rosenberg. 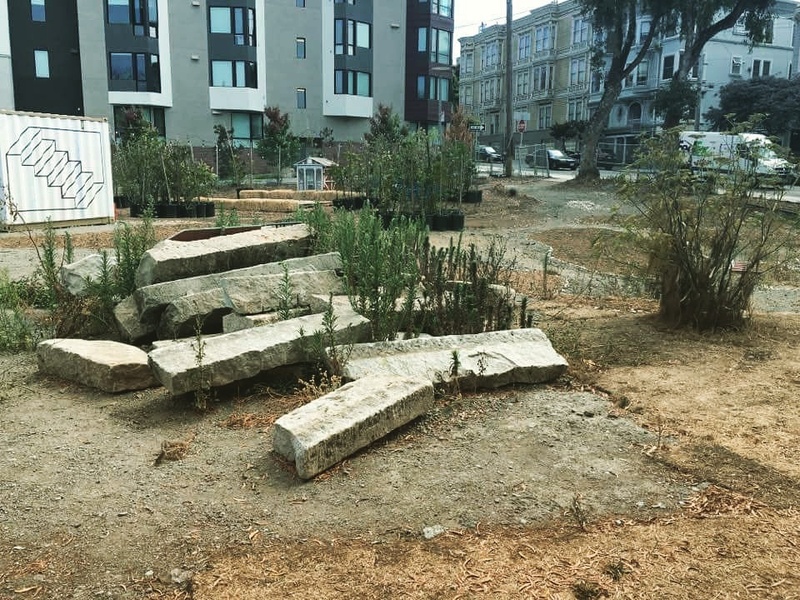 Participants of all ages are invited to join local artist Sonja Hinrichsen for an interactive workshop to create a piece of public art to be displayed at Hayes Valley Art Works. Space will be limited, and registration will open on Thursday, May 12th. More details will be available at that time – stay tuned! You are invited to Hayes Valley Art Works on Saturday, April 30th at 1pm. Calling all artists for our first organized art show, New Quarters. Applications are being accepted at bit.ly/HVAW-NewQuarters. The submission deadline is Monday, May 9, 2016. Attend the Info Session on Monday, May 2 at 5pm, and meet our new Artist Community Coordinator, Emma Spertus. Hayes Valley Art Works (HVAW) announces New Quarters, an open call for entries exhibition open to artists working in all media. We are looking for existing artworks or proposals for installations for HVAW inaugural show, New Quarters, which will be on view from June 4-July 9, 2016. HVAW invites all artists interested in showing their work at our ~ 38,500 sqft site. The interim use lot is largely undeveloped, we do have one shipping container that will be used as gallery for hanging works or displaying weather sensitive pieces. The exterior portions of the full sized shipping container and another half sized container are also available for display or installation. Submission Deadline: Monday, May 9, 2016. Eligibility: Open to artists working in all media. Submissions: Artists may submit up to five images of work created in any media. Only submit images of work available for the exhibition. We encourage artists applying for New Quarters to visit in person the Hayes Valley Art Works site before submitting. The site is open everyday except Tuesday from 12-5pm. Attend the New Quarters Info Session on Monday, May 2 at 5pm. Please RSVP to emma@hayesvalleyartworks.org.